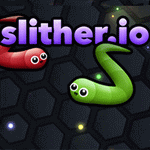 Play Slither.io Online For FREE! - Play against other people online! Can you become the longest player? Watch out - if your head touches another player, you will explode and then it's game over..